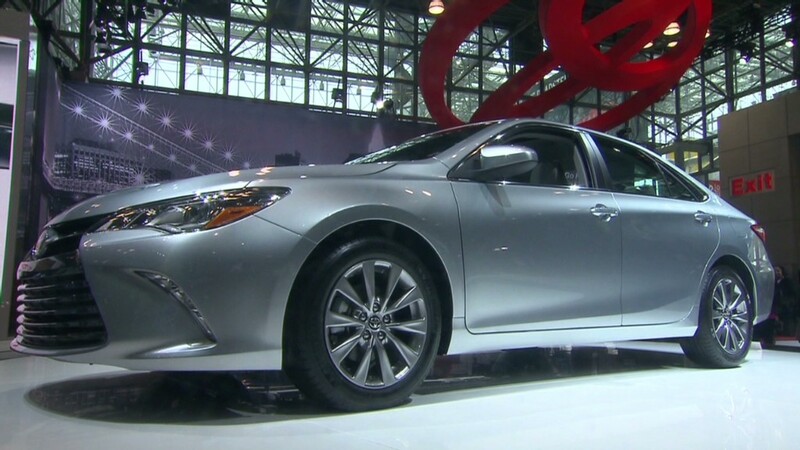 In a bid to maintain its standing as America's most popular car, Toyota unveiled a substantially redesigned -- and less conservative-looking -- Camry at the New York Auto Show Wednesday. "Customers today love the durability, quality and value that the Camry represents, but they are looking for a little more style, comfort and performance, and this 2015 Camry has all of the above," Bob Carter, senior vice president of Toyota Motors Sales, USA, said in a statement. The Camry mid-sized sedan has long been the best-selling passenger car in the United States, although it has been facing pressure from an onslaught of improved mid-sized sedan competitors including a new Honda Accord and a stylish new version of the Ford Fusion. For the most part, the Camry's engineering remains unchanged from the current model, but the body style has been changed significantly. Changes have also been made to the car's suspension to improve handling and responsiveness, making the new Camry feel sportier than the current version, according to Toyota. "I think it looks good," said Jake Fisher, head of auto testing for Consumer Reports magazine, "It's got a little bit of style." It's also almost two inches longer than today's Camry and almost a half inch wider. The interior has also been changed with a "more refined" design and higher-grade materials, Toyota boasts. Toyota also claims that this is the "quietest Camry ever" with more sound-insulating materials and side mirrors designed to reduce air turbulence and wind noise. More welds have been added to the body increase stiffness for better driving feel. Changes have also been made to the car's steering and brakes to improve performance and feel, Toyota (TM) said. A new Camry XSE will be the most performance-oriented version, with Toyota calling it "the sportiest Camry yet." Besides cosmetic changes, including a unique grill, it will have sport-tuned shock absorbers and and other suspension changes. Fisher was suspicious of Toyota's claims to have significantly improved the car's handing. Without major changes to the overall car, he said, it's possible that small suspension changes could roughen the car's ride without big improvements to responsiveness, he said. Any real sense of how the new car feels will have to await test drives in coming months. Engine and transmission choices will be the same as in the current Camry, including four- and six-cylinder engines and a hybrid version. Also at the New York Auto Show, Korean automaker Hyundai unveiled a new version of its Sonata, a direct competitor to the Camry. As with the Camry, the redesigned Sonata won't offer new engine and transmission options but it does offer a new look, more interior space and promised improvements in ride and handling qualities. Pricing details for the Camry will be announced closer to the fall, when the car is scheduled to hit showrooms.